Turning a ho-hum bedroom into a pretty, welcoming and cozy retreat. It all starts with the perfect bedding. 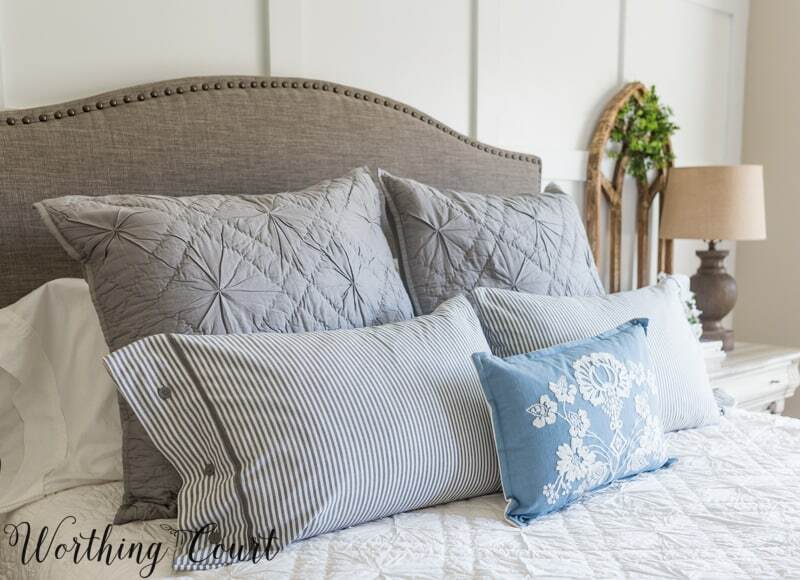 Just like with anything, to get a beautiful end result, you need to start out with the right base, so I chose the gorgeous white Andrea Quilt and two gray Andrea Euro Shams from Emory Valley Mercantile to go along with and serve as the perfect base for my accent bedding pieces. If you’re looking for some great quality bedding, now is the time to purchase these two items as they are currently on sale for a great price! The white Andrea quilt can be purchased by clicking HERE. The gray Andrea Euro Shams (standard shams are available too) can be purchased by clicking HERE. Are you familiar with Emory Valley Mercantile? It’s an amazing online shop that specializes in unique farmhouse, French country and vintage style items for every room of your home. I love browsing their website whenever I’m on the hunt for something. But back to the bedding. 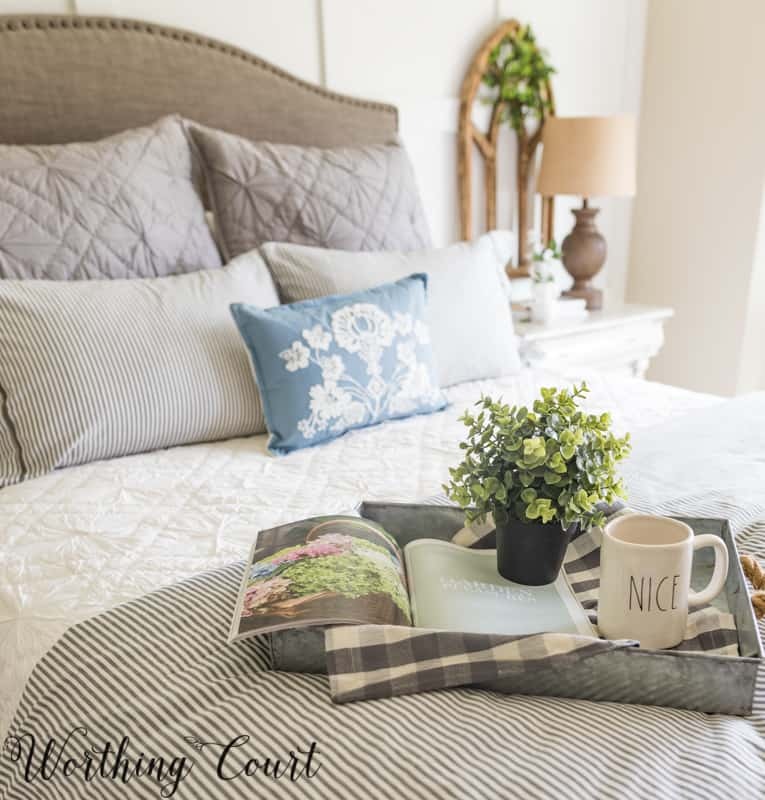 Since the bed is nearly always the main centerpiece and the most important thing in a bedroom, it was important to me that the bed in my guest room be just so. I wanted to create an inviting cocoon-like bed that would scream “come snuggle in me” and I did that with layers of cozy pillows and quilts. Much to my husband’s dismay, I’m a pillow lover and the more the better! I just about always use four layers of pillows on my beds – the first layer, against the headboard, is the pillows that are used to sleep on, the second layer consists of euro shams to add height, the third layer of pillows is placed in front of the euro shams and is something that matches or coordinates with the rest of the bedding and the fourth layer is a single accent pillow. The next thing you’ll almost always see me do is to place a folded comforter at the foot of the bed. It’s a great place for an accent and really does get used for additional warmth when the room is chilly. And lastly, I love to add a bedskirt when I have a bed where I don’t want to see the gaping dark emptiness under the bed. I love to use plain white sheets with at least a 300 count or higher. Plain white goes with everything! 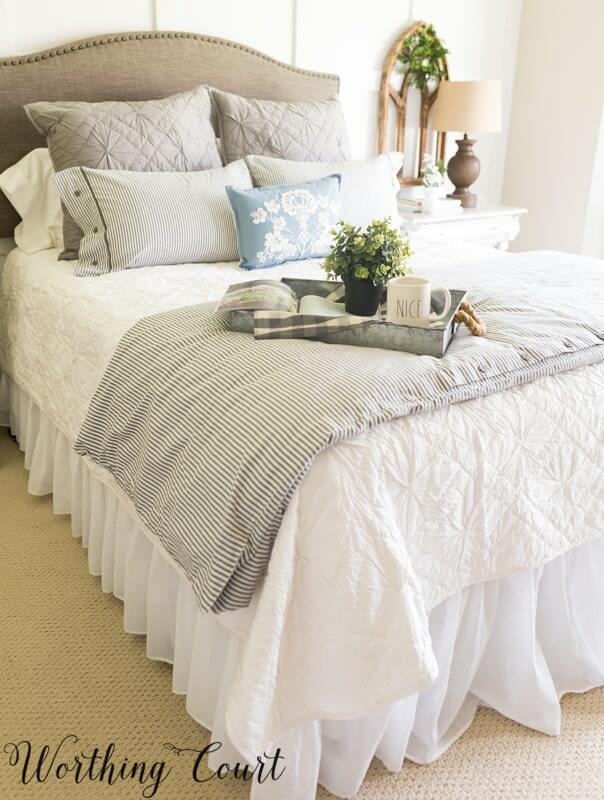 Add a plain white blanket between the sheets and the coverlet. Use mix and match bedding instead of a set where everything matches. This ain’t your grandma’s bedroom! For the most versatility, use a neutral color, with little to no pattern for the largest piece on the bed – the coverlet. Add a folded comforter or throw at the foot of the bed. This is a good opportunity to bring in pattern and color. Add layers and layers of pillows. Using plain white pillowcases allows me to simply “hide” the sleeping pillows behind the decorative ones without having to actually put them into a pillow sham. Remember that on average, you’ll spend 1/3 of your life sleeping, so strive to make your bed the best spot in your home! Pssst! Get the step–by-step tutorial for how I painted my furniture by clicking HERE. Love getting your post. So much good information. love the guest room. Such good ideas. Your guest room is beautiful!!! I love the bedding! Will you share where you got the folded comforter? I want a ticking stripe comforter-not a duvet cover, as husband detests duvets, and I am having ZERO luck finding one! Your room is gorgeous!! Thanks for the inspiration. I am beginning to make our master over and am chasing my tail. Beautiful! Iget so much inspiration from your posts-thank you! I see a peek of your end table and I know I’m going to love it! Your bedding looks so comfy!! Very pretty room, and welcoming. Nicely done! And I see that you didn’t paint the original ornate head and foot boards. I like the one you chose much better. It’s very serene and inviting-looking. I could sleep there! Hi Donnamae. Sorry about the delay in responding. I’m having some technical issues with being notified of new comments. Anyway, it is a duvet cover at the foot of the bed and I have it stuffed with a the cheapest down insert that Ikea sells. It’s beautiful! I love the wooden cathedral window frames, where did you buy those? Hi Deb. I found them at a local shop. Suzy, beautiful creation on that guest bedroom! 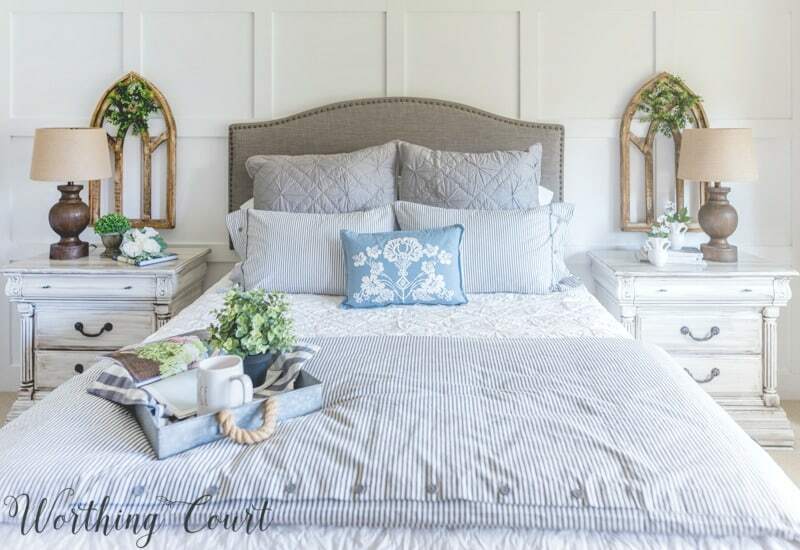 I especially love the white quilt and blue accent pillows. The quilt is so pretty and restful looking, while the pillows bring in pops of color. Also love the pillows on the chairs, love the chairs, too! A very well put together room anyone would love to sleep in! I am looking for a white quilt right now, twin size for my small guest room. You have inspired me! I love this entire space. And I agree about bed skirts. Plus, I tend to keep seasonal items stored under the bed and skirts hide all of “ugly.” Somewhere along the way, I read a blog that suggested turning the sleeping pillows so that the opening of the pillowcase faces the middle of the bed, rather than the outside edge of the bed. I LOVE the look now. The decorative bed pillows hide the open edge of the pillowcases. Clean edges all around. So much pillow love! This is my first time visiting with you and it surely won’t be my last. I stumbled upon you in a blog with others. 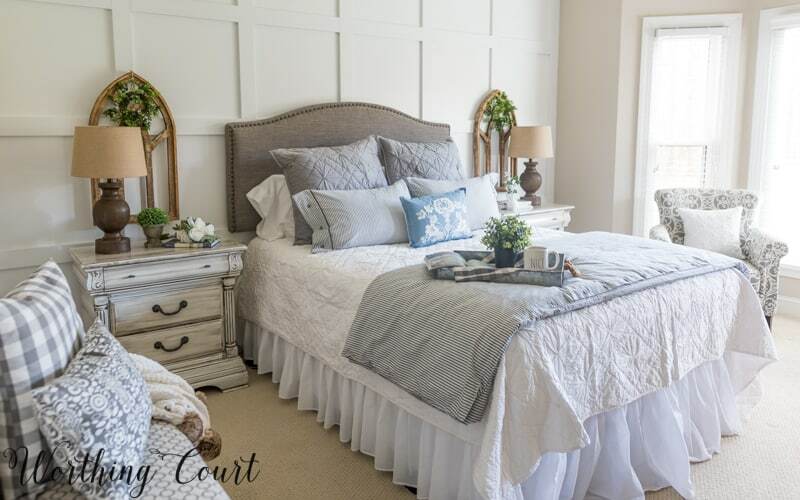 I have been been struggling with the idea of wanting blue in my bedroom, (no other blue in the house), but my favorite look is creamy beige and soft brown. After finding you, I see I can do both without breaking the bank or driving my husband crazy with big changes. Just that little addition with the blue pillow will be perfect while keeping my husbands marbles intact. Thank you for the information about pillow staging, I always wondered how to do that. Here’s to many more conversations, much shorter next time, I hope.